What to Wear with Oxford Shoes: do You Have to go All the Way with Classy? You’ll definitely recognize oxford shoes even if you’ve never had a pair yourself: classy style, tiny perforated holes making ornaments and specific lacing have made oxford shoes outfits really peculiar. But while this shoe type awareness is so high most people would still need help on what to wear with oxford shoes apart from a fancy suit especially when it’s a girl who’s planning on buying these. Sit back, relax and soak in all the useful info! Have to stick to the dress code at work dying to show off on a dress down Friday? 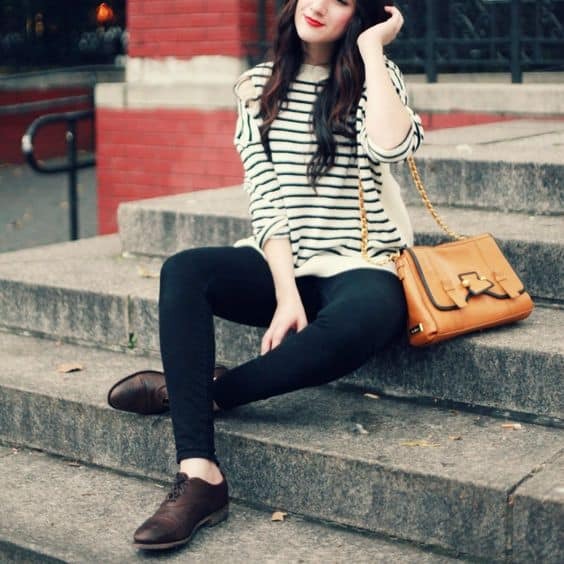 Then you’ll appreciate these oxford shoes outfit ideas which will help you express your individuality without having to violate the code. When you think about the bestways to wear oxford shoes pants are gonna be your priority. 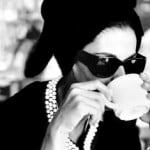 There’s no way one can screw up something as classy as it is! Straight classy pants and a shirt, high waist crop pants and a blouse, skinny pants, a top and a blazer – it’s all gonna work great for you! 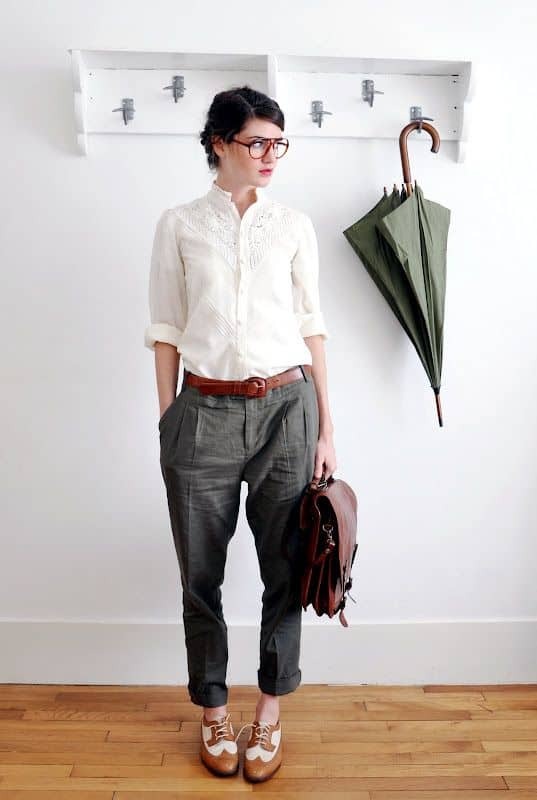 Even though skirts go with oxfords extremely well pairing them to create an office outfit might be tricky. The thing is that the best options feature skirts which are probably not appropriate in your company. You can still try and make it work though. Tea length and a bit over the knee skirts is what looks just amazing in formal environment. And doesn’t really matter what cut you’re gonna choose: both pencil or circular will do the trick. 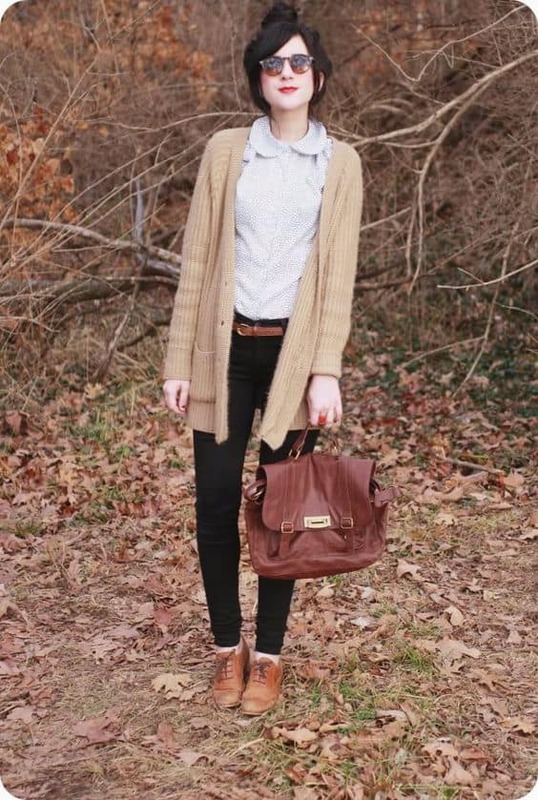 Wondering how to wear oxford shoes with dresses? Get a pair of thick non-transparent tights first! Surprisingly such tights look just right with long sleeve dresses and as for the length, we wouldn’t recommend going below the knee. Tip: We’re only talking about flat oxfords here. Anything with high heel is a different story and can’t really be considered proper oxford style. 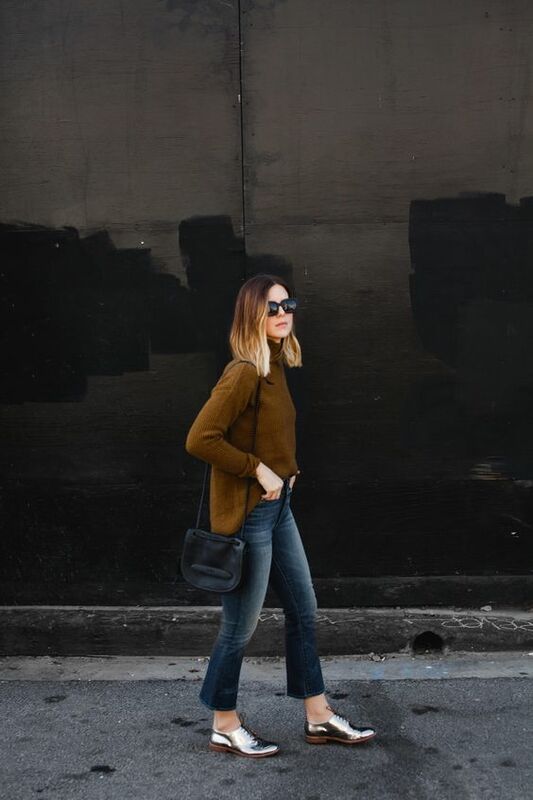 Not only does it require totally different outfit choices, but we also feel like it is way less trendy and stylish. Skirts and dresses has always looked nice with flats, but to get cute outfits with oxfords we suggest that you choose an extraordinary pair. You don’t have to go black or brown these days cause oxfords are available in a variety of cute color and textures from neon to crazy prints to metal plates! BTW: There’re oxfords which look more like ballet flats with really thin sole and light fabric. But the true ones have to look and feel pretty chunky and solid with rather thick sole and leather top you won’t be able to dent or squish that easily. When we say casual you say jeans and that’s how it works for most people nowadays. Thankfully jeans and oxfords is one of the best matches you can think of. 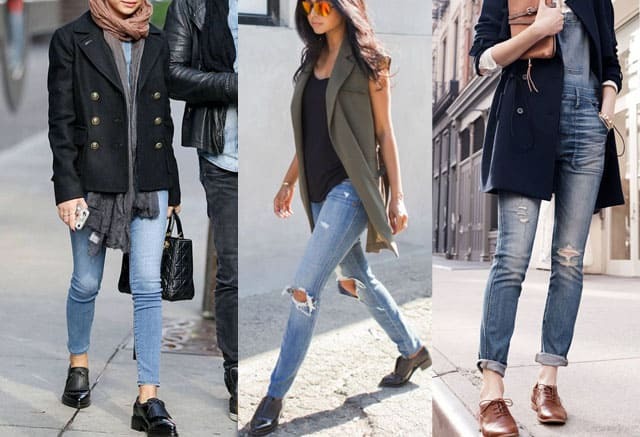 Boyfriend jeans will give you a laid-back look, skinny will look trendy and accentuate your beautiful legs. Straight ones are also a great choice and even though it’s a tougher task we’re sure you could rock flared jeans as well if you wanted to. For example, oxfords look sweet with mustard yellow top and short brown skirt. Also in cold season oxfords go well with almost any type of jackets and coats except for probably fur and down coats which look either too posh or too sporty. And don’t forget about a fancy scarf to warm you up! As for tops, well the pool is so diverse we’re not gonna limit your choices. Baggy sweaters, printed T-shirts and loose cotton shirts are our favorite though. 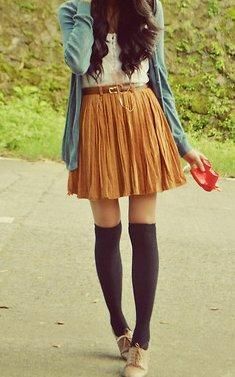 Light brown oxford shoes and orange skater skirt with thigh high socks. Romantic and cute image. Brown oxford shoes and striped blazer with orange bag is a fashionable image, which only highlights your personality and internal charm.